The Sierra Designs Flashlight UL2 is a non-freestanding ultralight backpacking tent that is designed to be used with trekking poles (or the included, optional, vertical poles) to cut weight. Ringing up at 3 lbs 2 oz it certainly accomplishes the goal at just under $359. With the optional vertical poles you’ll add an additional 6 oz to the weight, if you’d rather leave the trekking poles at home. A slightly heavier model is available, and weighs 3 lbs 6 oz without the vertical poles, or 3 lbs 12 oz with them ($259 for the non UL version). The tent ditches vestibules in favor of awnings, and moves the gear storage to the sides of the tent, out of the way from the doors. Clips secure the “gear closet” and protects your precious gear from the elements. Double layer doors with a waterproof panel and a mesh layer allow you to unzip the waterproof wall to unveil a full mesh door for visibility and ventilation. 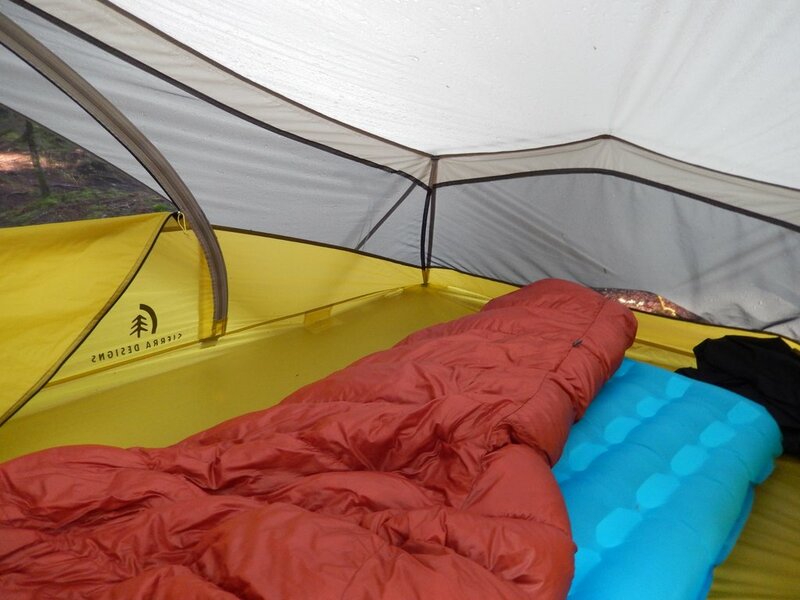 The tent is built from a fused hybrid double/single wall design, which enables you to pitch the tent in the rain without fear of water getting inside the tent thanks to the inner and outer body of the tent being fused together. This also reduces the weight, without sacrificing the build quality by using unnecessarily thin materials. Included vertical poles(or trekking poles) support the head of the tent, while a smaller pole with bends creates the frame of the foot of the tent. The Flashlight is incredibly spacious for it’s weight, or for any backpacking tent for that matter. Ample headroom allows for conflict free movement even when two campers are inside. Caverns of foot space and a luxuriously wide floor creates a very livable environment, well beyond what most backpacking tents offer. The “gear closets” allow for enough room for all of your equipment to be stored outside and out of the way of the door. 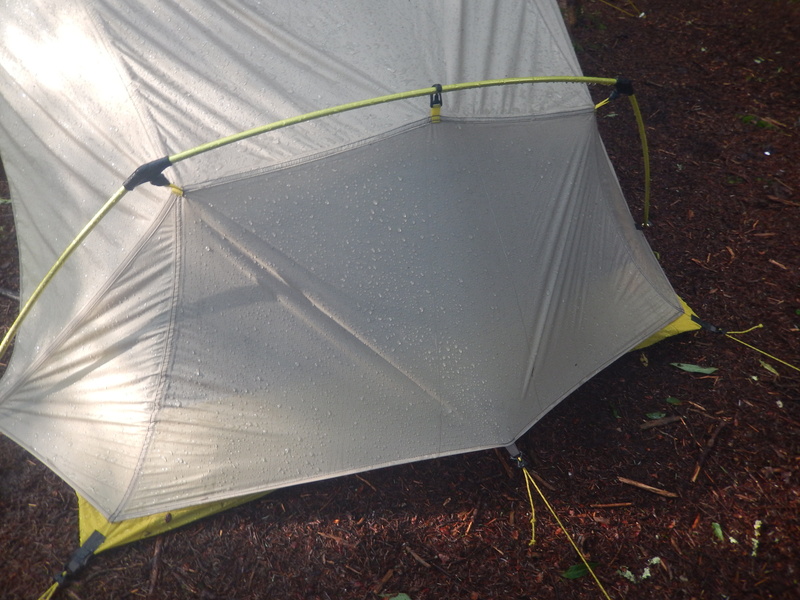 All of my gear stayed dry through monsoons of rain and humidity, while still being easily accessible without leaving the tent. A simple clip secures the closet closed in one of two points. One allows for unobstructed entry and exit, while a second clip located just past the door allows for more storage capacity and protection, while still allowing you to enter and exit the tent with no fuss. The tent pitches with minimal effort with only 6 tent stakes being required for a full pitch, while additional guy out points increase the wind resistance (only 8 stakes are used even fully guyed out). You simply stake the tent out, insert the poles, lift the poles up and you’re ready to go. 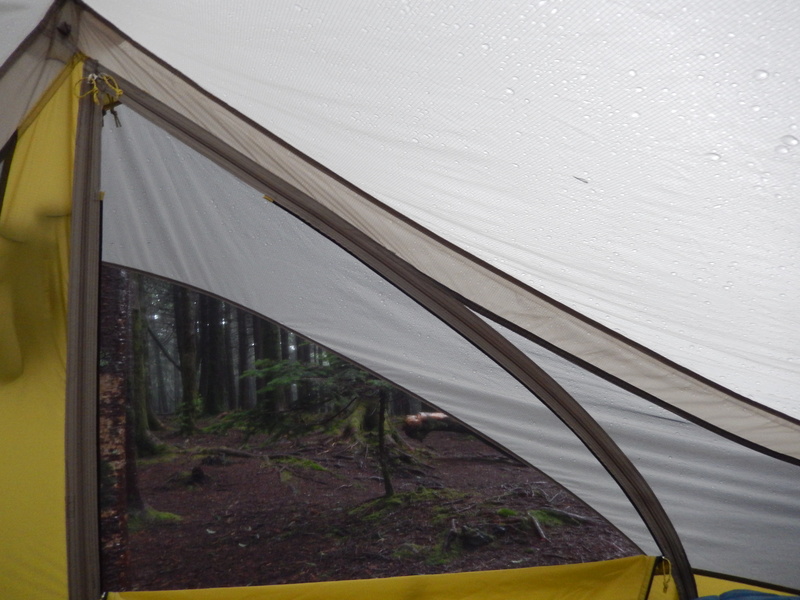 The tent pitches fairly taut, with adjustable tensioners placed at all the right places around the tent. The flat wall above the head has a great guyout point centered on that wall, which pulls it out and away from your head, giving more room and stability. Being a non-free standing tent I was initially concerned while pitching the tent on a 6000 foot peak in soft duff with little traction for the stakes (easily pushing the tent stakes completely in the ground with a bare palm), but despite the constant rain and wind the tent didn’t budge, shrugging off the grueling conditions while keeping myself and my partner dry and comfortable. Ventilation is good thanks to the ability to unzip and drop the protective waterproof walls on the tent doors, revealing a large mesh window. This combined with the awning above the door allows for the window to be left open during most rains, and really enhances the atmosphere when hunkering down during a storm. Just being able to look out and watch the weather is a treat in itself. 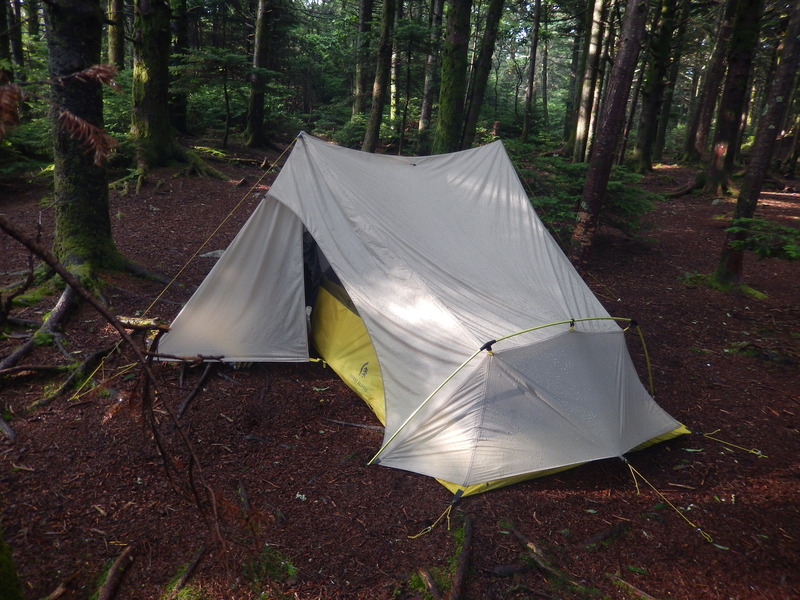 Build quality is excellent all around, with reinforced connections for the vertical poles, DAC NSL Pressfit poles (UL Model), quality tent stakes, and a tent floor durable enough to leave the footprint at home. Rain rolled off easily, and the coated walls resist condensation. 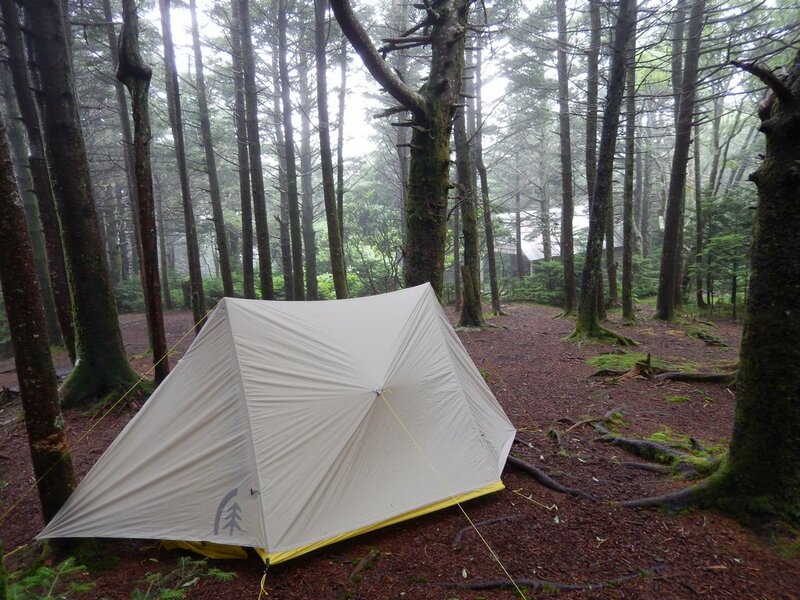 Living in the Smokey Mountains, condensation is always an issue with any tent. It’s unavoidable. The only complaint I really have with this tent is the head of the tent, just above your skull, is a single wall with no mesh. During one storm (admittedly terrible conditions, camped literally inside the cloud during a rain with all vents closed up due to the unexpectedly frigid storm), condensation gathered liberally on the head of the tent as the cloud blew through my tent. Occasionally a large glob of water or a stick would fall out of the trees and onto the tent, which knocked the building droplets off the wall and onto my face. It was minor issue, and in more typical conditions this wasn’t a problem. Holding strong after 12 hours of constant rain in the duff. Having a tent that is so massive but weighs so little almost seems like cheating. While most non-freestanding tents are a pain to setup, this tent pitches easily and quickly even in poor soil. Thanks to the solid build quality and engineering, the shelter resists the foulest of weather, and provides enough storage space to keep all of your equipment safe without compromising usability. Massive amounts of living space combined with good enough ventilation for all but the soggiest of conditions, and an easy set up make this tent an easy recommendation. Thanks to the manufacturer for providing this product. For full disclosure, see our about me page. Thanks! The fly creek is a great one. Incredibly light weight. I’ve been using one for years. hey did this come with a footprint? 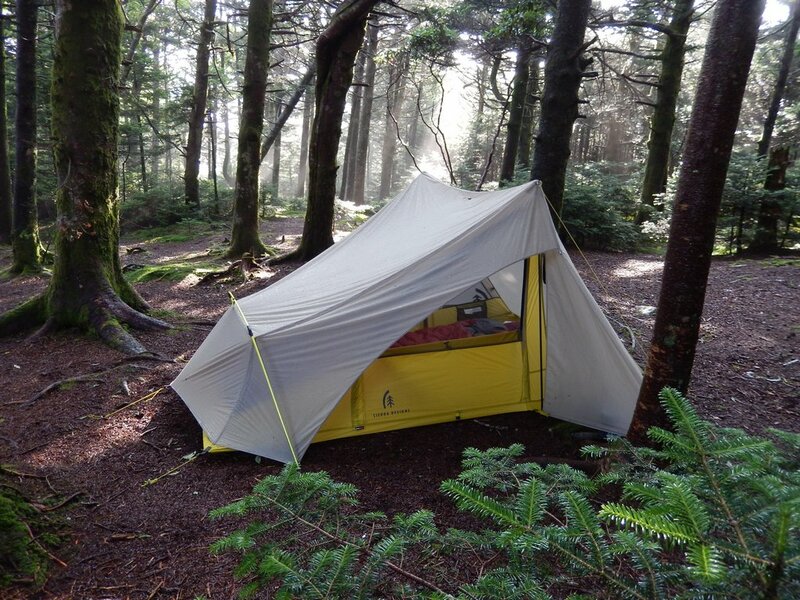 is it possible to buy a footprint with this tent? No footprint, but they are certainly available. I cannot recommend one however. I makes more sense to just get the non-FL model, with the thicker floor. It will be tougher, cost you less, and actually weigh less than an FL model plus the footprint. The FL floor is pretty though, and really doesn’t need protecting, however.